It's 1871. August 15th, to be precise. The eminent American Freemason, Scottish Rite Sovereign Grand Commander Albert Pike, sits down at his desk and, by the flickering light of a candle, composes a letter to his friend and fellow Mason, the Italian politician Giuseppe Mazzini. Absolutely nothing, that's what. Why? Because the letter is complete and utter hogwash, made up by admitted hoaxers and perpetuated by unscrupulous "researchers" who are more interested in getting clicks than telling the truth. 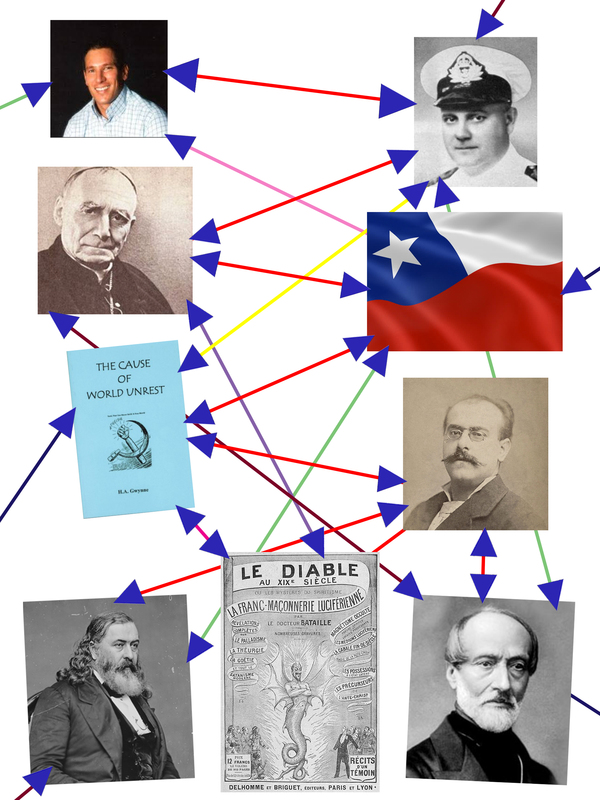 "Michael Haupt said that William Guy Carr said that Cardinal Caro y Rodriguez of Santiago, Chile said that The Cause of World Unrest said that the confessed hoaxer Gabriel Jogand-Pagès aka Dr. Bataille aka Leo Taxil said that Albert Pike wrote Giuseppe Mazzini in Le diable au XIXe siècle, v. II, 1892-1894, p. 605 (but actually pp. 594-606)." No, of course it doesn't, because this is a hot tangled mess of madness. But if you really need the full story then you simply must read Terry Melanson's careful, point-by-point unraveling of this pointless game of telephone. Back in 2010, Melanson decided to get to the bottom of this "Pike prediction letter" and, as you will see, went step by step back through the chain of quotations to get to the actual source of this rumor. I cannot stress this strongly enough: Read Melanson's article! But here it is in all its glory: the first actual written reference to this letter. Given the vagaries of Google Books, it's entirely possible that you won't be able to access the full source depending on your geography, but Melanson does have the translated text in his article. Go on, read it for yourself and tell me where it talks about a First World War. Or a Second World War. Or a Third World War. Or "atheistic Communism." Or Nazism. Or political Zionism. Or any other words or phrases that weren't even coined at the time this letter was supposedly written. Hmmm, funny that. There's no mention of those things whatsoever. When you follow Melanson's steps in putting together the chain of references, you'll see that all of that World War/Nazism/communism/Zionist/Illumanati talk was added in by William Carr several decades after this whole fictitious letter was invented. As was the rumor that the letter had been "catalogued" in the British Museum Library. And it was several decades after Carr that a man named Michael Haupt re-popularized the fiction, making it the basis for his "Three World Wars" website. And this is where Carr's vague summary of this letter (that never existed) was magically transformed into a direct quotation from the letter. Only one part of the whole thing (the bit at the end about bringing the "True Light" of the "pure Luciferian doctrine") is actually in the original "source" of this letter (which, once again, has never actually been seen because it was never actually written). And now those crack journalists at The Daily Star are resuscitating this whole pile of garbage yet again to harvest a few more clicks out of it. Once again, you can't really appreciate how convoluted and silly this whole rumor is until you read Melanson's article, but the long story short is that a hoaxer made up a letter between Pike and Mazzini which then got picked up and summarized by others, which then got picked up and added to by others who provided vague summaries of information that never existed. Those summaries then got turned into direct quotations and continue to get passed around the internet as if they were true. Well, it should. Anyone who is concerned about truth and who is looking to set the record straight on the many real instances of cover-up and conspiracy throughout history should be offended when people purporting to do the same are in fact just regurgitating tired old debunked nonsense that they didn't even bother to research. After all, there is a reason why the "crazy conspiracy loony" meme that the CIA has weaponized continues to hold sway with such a large part of the population. It's because there are "crazy conspiracy loonies" (or, more to the point, knowing frauds) who spread easily debunkable garbage, and not enough people in the so-called truth community calling it out. This is why I have spent time setting the record straight on the JFK/Fed Myth. And the "Adorno wrote The Beatles" myth. And the "footage of the missile at the Pentagon" myth. And the Shemitah myth. And the "fat Osama video" myth. It's why I've debunked Patriot Mythology (and More Patriot Mythology). If you take the search for truth seriously, I think you'll understand this impulse. Now, none of us are perfect. None of us are always correct. None of us have the time or ability to check the source of every piece of information we ever encounter. But when passing information on to others we have a duty to vet that information and make sure it's worth passing on. That is not a high hurdle to get over for anyone who is actually interested in spreading truth. For those of you out there who had never even heard of this whole Pike letter foolishness, I almost feel sorry for bringing it to your attention. But Melanson's dissection of the story is valuable as a case study in how to track down the source of questionable information, so perhaps it is worth it. All I know is: World War III is a subject worthy of further inquiry; Pike's supposed prediction of it is not. The Table of Contents for the full text will come online later today as well. When everything works out with my internet the full text will appear next week (as one article or as it is probably too big for steemit/steempeak in several pieces) and then I will link them all under your video with Vinnie about the Beatles. Thank you for your fine article, James, and for sharing Terry Melanson's research. I found Pike's "letter" to be compelling but came to a dead end when trying to source the origin of it in the research I did over 7 years ago. The reason it was so compelling is due to the fact that this was a conspiracy, not a theory, that was afoot in the City of London regarding the Rothschild dynasty during the 20th century. Perhaps William Guy Carr used Albert Pike as a straw man to deflect the conspiracy away from the City of London while drawing attention to it. The conspiracy itself revolves around the creation of the modern state of Israel and the outcome will likely be the same. We have seen the brink of WW3 many times in recent days with the proxy war in Syria. Now, war with Iran may be next. "The founding of Israel was a project of the Business Roundtable – a Chatham House City of London project later known as the Royal Institute of International Affairs (RIIA). They pushed through the private Federal Reserve bank in the US in 1913 while President Woodrow Wilson relaxed Revolutionary War-era tariffs aimed at the East India Company and other Crown Agents. In 1917 the RIIA overthrew the Romanov dynasty in Russia with phony Bolshevik revolutionaries funded by the Kuhn Loeb and Warburg banking dynasties. That same year Roundtable member & British Foreign Secretary Arthur Balfour sent a letter to fellow Roundtabler Lord Walter Rothschild declaring support for the establishment of Israel on Palestinian land. It became known as the Balfour Declaration. The Crown then backed the rise of Adolf Hitler and the subsequent de-industrialization of Germany. Soon they had their pretext for a mass exodus of Zionist Jews to Israel where that nation would serve not as a safe Jewish homeland, but as a regional enforcer for the Rothschild/Rockefeller oil cartel. The 1922 Treaty of Jeddah established the exact same role for the House of Saud. The RIIA Crown Agent in the US is the Council on Foreign Relations, which pretty much dictates US foreign policy through its widely read Foreign Affairs rag. The Atlantic Council is another Crown Agent RIIA affiliate." @corbettreport You have received a 100% upvote from @botreporter because this post did not use any bidbots and you have not used bidbots in the last 30 days! I knew the Pike letter was bogus because Pike never mentioned the ozone hole crisis, acid rain, reefer madness, opiate appocalypse, or Hillary.